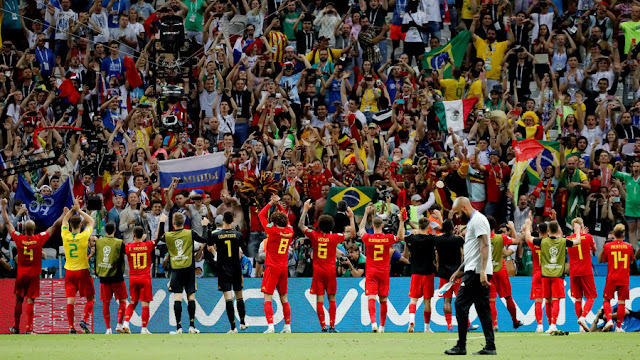 Belgium have been lauded for their performance in qualifying for their first World Cup semi final since 1986, as their so-called ‘golden generation’ sweep past five-times champions Brazil to set up a date with France. Belgium’s 2-0 victory, secured by first half goals from Kevin De Bruyne and a Fernandinho own goal, has ensured that the World Cup will be won by a European team as Brazil crash out in Kazan. Brazil’s goal came through substitute Renato Augusto as the South American side upped the tempo in the second half as they stared elimination in the face but in the end the combined efforts of Neymar, Philippe Coutinho and co. couldn’t break down a resolute defense. Chelsea’s Thibault Courtois pulled off a stunning last-minute save to deny Neymar but in the end it was difficult to dispute Belgium’s superiority, with De Bruyne, Eden Hazard and Romelu Lukaku particularly impressive. Roberto Martinez’ side will play France in the World Cup semi final in the St. Petersburg Stadium on Tuesday in an encounter which is already whetting the appetites of many a Twitter user. The debate is now over, EDEN HAZARD is Better than Oscar awards Nominee Neymar. Another enthralling game. This World Cup is ridiculously good. Brazil is out, Belgium advances. No more South American teams in the #WorldCup. It looks like we're going to have a European champion.